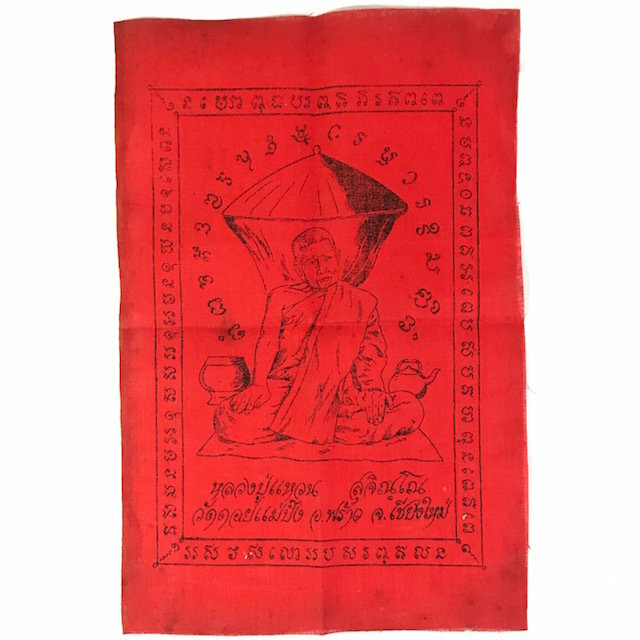 Pha Yant Daeng Luang Phu Waen Pak Glod - Red Prajiad Yantra Cloth with an image of the Great Arya Sangha Monk, Luang Phu Waen Sujjino of Wat Doi Mae Pang. The Pha Yant features Luang Phu Waen sitting under his Glod Umbrella, which is the Ubiquitious accessory for all Forest Dwelling Monks on Tudong. Images of Guru Monks are seen by Devotees as sacred objects which have had direct contact with the Master of Choice. This is of course an obvious relation to faith in the Guru, for those who seek not just an amulet, but a connection with the Guru, in this case, the High Arya Sangha Monk, Luang Phu Hwaen Sujjino. This Pha Yant can be folded and placed in Pocket (above waist) and is worshiped as Buddhanussati (remembrance of the Guru, and the Triple Gem) and to recieve the protection and blessings of this great Arya Sangha Monk, who was one of the Greatest Master Guru Monks of the last Century, Luang Phu Hwaen Sujjino. Luang Phu Waen Sujinno (Thai: หลวงปู่แหวน สุจิณโณ, meaning Venerable Grandfather; 16 February 1887 – 2 July 1985) was one of the longest living students of Pra Ajarn Mun Bhuridatta and was a very popular monk in Thailand. He led the Tudong Forest Tradition life, until the point where he could not physically travel any more and had to settle in a forest monastery in the Chiang Mai region. Luang Phu Waen Sujinno was a monk highly skilled in Samadhi and Dhamma.